The Humphrey® FDT Perimeter uses Frequency Doubling Technology to provide a clinically verified, fast, and accurate means of detecting early visual field loss. The FDT is the ideal visual field screening device because it conducts supra-threshold testing in only 40 seconds per eye. We screen every patient with the FDT Perimeter and were the first practice in central Pennsylvania to incorporate this technology. The Optomap exam is fast, painless, and comfortable. Nothing touches your eye at any time. It is suitable for the whole family. To have the exam, you simply look into the device one eye at a time (like looking through a keyhole) and you will see a comfortable flash of light to let you know the image of your retina has been taken. Under normal circumstances, dilation drops might not be necessary, but your doctor will decide if your pupils need to be dilated depending on your conditions. The capture takes less than a second. Images are available immediately for review. You can see your own retina. You see exactly what your eye care practitioner sees – including a 3-D animation. We incorporated the Optomap into our practice in 2006. The Optomap is available for an additional charge of only thirty dollars. In some cases, it may be covered by your major medical insurance. Barrett Vision Center LLC now provides an even more thorough examination and diagnosis of your retina than ever before with the Zeiss Cirrus™ high-definition OCT. This cutting-edge diagnostic system allows our doctors to get a complete cross-sectional or 3-dimensional view of your retina. 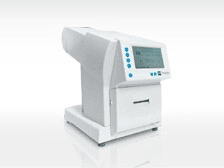 The EPIC-2100, from Marco Technologies, is an integrated digital refraction system that exceeds our expectation for consistency and accuracy. It is an example of the new “smart technology” on the market today. The EPIC-2100 has the capability of allowing us to make an immediate comparison between your current refractive error, your old prescription, and your new prescription. The end result is a very precise diagnosis of your vision. Best of all, the process is completed quickly, saving you time – a precious commodity in today’s fast paced world. We began using the Epic system in 2001 and were the first practice in central Pennsylvania to use this new technology. Visual field testing is an important tool in the diagnosis and management of glaucoma. It is used to confirm that glaucoma has affected the visual function, to evaluate the severity of, and to monitor progression of the disease. 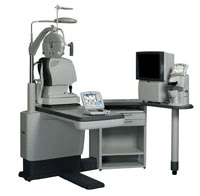 The Humphrey Field Analyzer is a wheelchair accessible, diagnostic tool used to examine a patient’s visual field. The Humphrey Field Analyzer is the recognized standard of care for early diagnosis and management of ocular diseases resulting in visual field loss.